Food Costs > How Much Does Spaghetti Cost? How Much Does Spaghetti Cost? Spaghetti, as most of us envision, is composed of pasta in the form of long, thin noodles, tomato sauce, ground meat and optional cheese. Even though spaghetti is just as common in America, it is still considered an Italian food. While every country has its own version of spaghetti, they all have one thing in common – it has tomato sauce and cylindrical pasta. There are many ways of making spaghetti: it could be homemade with freshly made tomato sauce or pre-made, which is often found in the frozen food section at your local grocery store. To determine the cost of spaghetti, let’s start with the basics: the noodles, sauce, meat and cheese. The cylindrical pasta, often referred to as spaghetti noodles, can cost $1 to $3 per package. An authentic box from Italy will usually be near the higher end while your lower end pasta will be processed locally. Making the noodles from scratch will often require flour, eggs, olive oil and a bit of water. All of these ingredients, if you don’t have them on hand, shouldn’t cost more than $10. If you need spaghetti sauce for your pasta, you can purchase a jar of it for $2 to $6, depending on the brand and ingredients. The basic store brand type will be on the lower end, while the name-brand organic sauce will be on the higher end. Again, if you want to create it, the costs will depend on your recipe, but more often than not, popular recipes will include onions, olive oil, garlic, tomatoes, basil, sugar and oregano. The most common type of meat that is used for spaghetti is ground beef; however, ground chicken or ground pork can also be used. This ground meat will range in cost from $2 to $6 per pound. Just like the sauce, organic meat will be more expensive. Overall, if you take into account the noodles, meat, and sauce, a pot of spaghetti will cost around $10 to $15, depending on the method being used. BudgetBytes.com, for instance, lists a recipe that serves six and says the total cost is $9.02 per serving. Spaghetti at some local family restaurants typically can range anywhere from $7 to $15 per plate. Spaghetti at an authentic Italian restaurant can cost from $10 to $25+. If you are purchasing a dish of spaghetti at a restaurant, this usually includes a dinner salad as well as some type of bread. If you are making spaghetti at your home, the most common side dish to serve with it is garlic bread. There are many different varieties of garlic bread, from Texas Toast to cheese bread. If purchased in the freezer section of your grocery store, this will cost $2 to $4, but again, will depend on your preferences. One of the favorite toppings for spaghetti is Parmesan cheese. You can purchase a container in the dairy section of your grocery store for around $3 or you can purchase fresh Parmesan for close to $15 per pound. 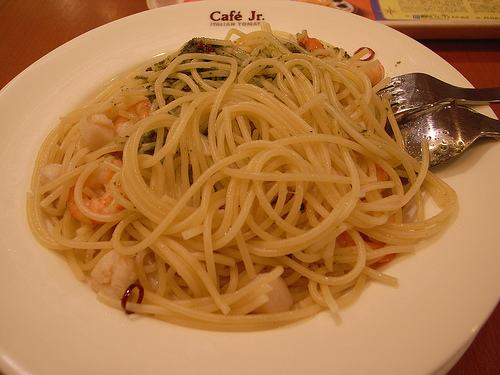 Spaghetti, as just the noodles, will often come in a 13, 16 or 32-ounce container. Depending on the brand, some noodles are made from whole grain, while others are Kosher certified. There are also new types of noodles that contain a full serving of vegetables. If you want to make your own spaghetti, it is best to separately cook the pasta and sauce and only mix them together when both of them were cooked separately. The best order would be to brown the meat, add the sauce and let it simmer for about an hour, then boil the noodles and combine them with the sauce. Store-branded noodles, cheese and sauces are going to be a lot cheaper than those name brands. If you do not mind purchasing store brands, this is a great way to save more than 30 percent. Many name brand companies offer coupons in the local paper and via social media. Search online to see what kind of deals you can potentially find. Pasta is heavily marked up at local restaurants. Because of this, try to avoid pasta based restaurants. If you are going to eat out, there are also coupons offered that are offered by different restaurants.